A 1965 Jaguar E-type once campaigned by Sir Stirling Moss is to be offered for sale by H&H Classics at RAC Woodcote Park, Surrey, UK on June 5. Sir Stirling drove the car in 1991 on the Manx Mountain Challenge, partnered by journalist Mike McCarthy. Although he had started his career as a Jaguar works driver, competing in C-types and XK120s, he had never previously competed in an E-type – making this car the first E-type that Moss ever drove competitively. 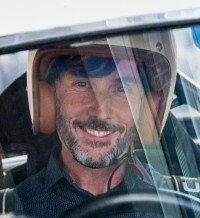 The car started life as a standard E-type roadster, and was converted into a road-going lightweight racer by Jaguar expert Jeremy Broad (father of current Jaguar specialist Guy Broad). It utilises many original components including an aluminium Abbey Panels bonnet reputedly originally fitted to Sir Robert Ropner's factory Lightweight. It's fitted with a 4.2-litre engine and five-speed Getrag gearbox. It was later raced by Le Mans and touring car legend Win Percy, who qualified third in the 40th anniversary race for E-type Jaguars at Donington Park in 2001. It goes to auction with H&H Classics on June 5 at the Motor Sport Hall of Fame sale at RAC Woodcote Park. It's estimated to sell for £110,000 to £130,000. For more information visit the H&H Classics website.